Time to get excited guys, guess what? For a limited time only, The Body Shop is dropping down the prices of all your favorite products. I went on a fun scavenger hunt at The Body Shop Glorietta yesterday to find out which of their products truly are Filipina favorites. After being given a clue sheet, I began my hunt. After hours of tireless searching (just kidding, took me less than 30 minutes :P). Here is what I discovered. This one's pretty obvious and one of my faves too, the Lip & Cheek Stain! Is this pretty much accurate? If it is, then you'll all be glad to know that the Body Shop has decided to significantly drop down the prices of these products so you can start hoarding on all your best-loved Body Shop goodies without having to shell out a small fortune! 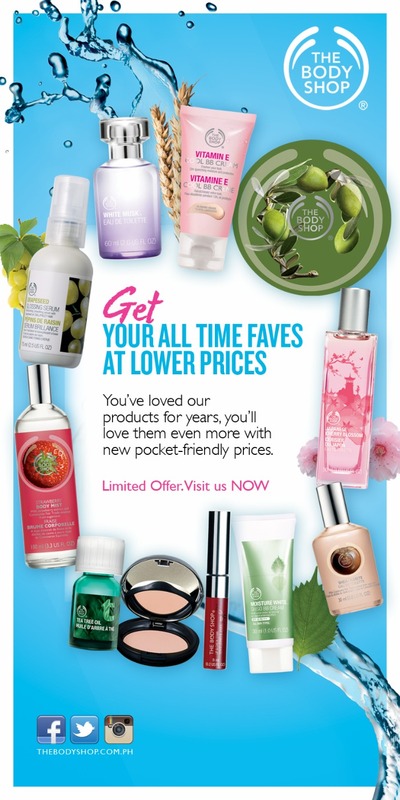 To check out for yourself just how low they decided to go with their All-Time Faves promo, see photos below. And aside from making things more affordable, The Body Shop also offers a unique service wherein you can pick up one of these sample containers and fill it up with whatever product you like so you can test it out first, see if it works for you before actually purchasing the full-size. Now we all know how important it is to check skin compatibility before taking the plunge. Take advantage of all these new ridiculously awesome offerings from The Body Shop by visiting a Body Shop boutique nearest you.